I have recently returned to London after 3.5 months away travelling around the Americas. I was eager to catch up on all I had missed in my favourite city during that time, and was ecstatic when I learned of an exciting new festival celebrating my most beloved drink – whisky – to take place at the end of September here in London. Titled the “Pure Festival” – the event will celebrate both whisky and music. 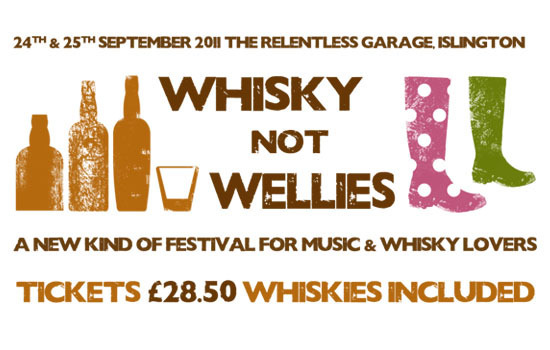 And with the moniker: whisky not wellies, it sounds like my kind of happening. During a press briefing for the event at the Scotch Malt Whisky Society near Farringdon, I met some of the chaps – all young, north-London types – who have brainstormed this exciting new venture. The event will take place on the 24 and 25 September at the Garage, near Highbury and Islington in north London, and will feature bands such as The Ravonnettes and Electric Soft Parade on Saturday, and James Yorkston and the Smoke Fairies on Sunday. Best of all: the whiskies. There are 10 distillers confirmed, including Ancnoc, Whyte and Mackay, Cooley and Talisker. Famous whisky critic Dominic Roskrow will also be on hand to doll out some very special drams from the World Whisky Master medal winners. The hope, the organisers say, is to take the festival on the road, bringing good tunes and better tastings to others. New York and Dubai are rumoured to be interested in hosting versions. That sounds like the perfect Gwilty Pleasure to get this whisky lover back into the swing of London life. The Pure Festival takes place on the 24 and 25 September at the Garage in Islington from 4-10pm. Tickets are £28.50, and include 8 tastings – allowed to be done from 4-7pm only – and entrance to the music festival. This sounds like a funtastic event! You had me at Talisker. Looking forward to reading all about it.